This week has been a great workout week for me. I have been hitting the gym and the pavement hard! I didn't get a run in yesterday like I had planned though, so I have to find time to make it up. It will be a 40 min. run. I will do sprint intervals. I would love for my pace to get quicker, although it really isn't my main goal. My main goal in this half marathon is to run the entire thing. Had you told me that it was possible when I began this training, I wouldn't have believed you. But now I am seeing a huge difference in my endurance. I think there is a wall that I hit while running. Once I get over that wall, things are just quicker, stronger and better. Last week in my 7.5 mile run (the longest ever for me) I was surprised that I felt better on the way back from that run than I have normally on a shorter run. It was really weird for me. I think that is why I was so emotional. Honestly though, I am NOT looking forward to the beginning of my long run on Sunday. We are doing 8 miles, and I know that when I begin that run, I am going to have to listen to that witch in my head try to tell me that I can't do it for an hour and a half!!! But I will beat her again because now I know I can!!! Want to Run the Women's Half Marathon St. Pete with me??? Enter to win a Free Entry to The WHM St. Pete on Nov. 18th! My ultimate fitness goal is to feel better about myself. To stop taking antidepressent medications. You are doing great, looks like a fun race! You're doing great Mindy!!! 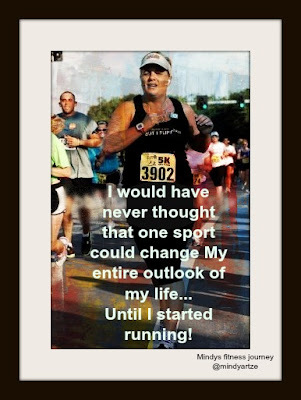 You are going to ROCK that 8 miles...You CAN do it!!! I love long runs so much more than short runs! I'm running my first half on the 23! My ultimate fitness goal is to run the Tough Mudder.